In the previous post, we have introduced readers to basic principles of time value of money and presented Python implementation of the calculator. The time value of money is an essential principle applied in almost all areas of the financial mathematics. Today, we will discuss one of them - the basics of yield curve construction and bootstrapping. Please note that full implementation of this example can be found here. On-the-run securities are those which have been issued recently, thus the most liquid ones. Unfortunately, there are often wide maturity gaps between them. Because of this, analysts often fill these gaps with additional off-the-run issues. For example, a 50-year bond issued 2 years ago effectively serves as a security filling the maturity gap of 48 years. It is even possible to combine all on and off-the run securities in such a way they will expire on the same date. This will naturally lead to collisions in yields and maturities, which can be then aggregated and interpolated for even better results. Another solution is to use treasury coupon strips. The coupon strip with a single payment is priced in a way which yields directly to the spot rate for given maturity. With this approach, the bootstrapping process discussed later will not be necessary. However, the drawback using coupon strips is different tax treatment skewing the whole calculation. Calculated yields to maturity don't necessarily correspond to those quoted in data file due to accrued interest and a fact that coupon payments are bound to specific calendar date, which is not necessarily one semi-annual period from now. As the time passes, the maturities of all issues are shortened by one day each day. However, if we want to compare the same yield curve across different dates, the maturities must match. 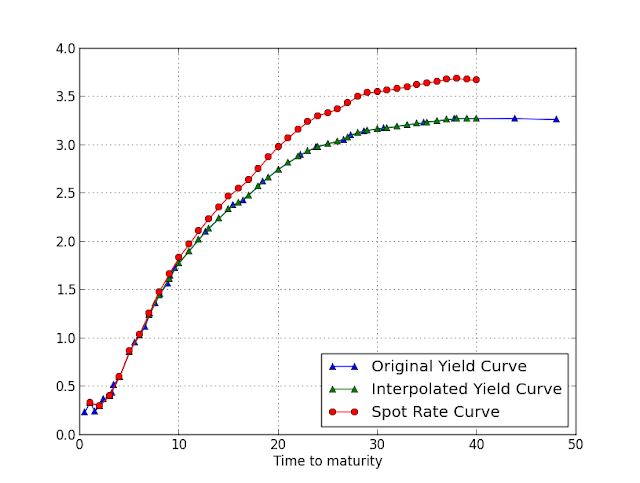 Hence, we need to interpolate and normalize all yield curves into a common set of maturities, e.g. 1m, 3m, 6m, 1y, 2y, 5y and etc. On the other hand, for the purpose of bootstrapping, it would be convenient to interpolate all maturities into a scale with annual intervals, such as from 1 year to 40 years. Therefore, we will go this way. The output of this step would be interpolated yield curve y with maturities t=1..40. Before going into details regarding the bootstrapping algorithm, we should explain the difference between yield curve and spot rate curve. By definition, the yield curve shows several bond yields to maturity (ytm) across different bond contract lengths, or times to maturity (ttm). Yield to maturity is an overall discount rate which equalizes principal and coupon payments to the initial investment value, assuming reinvestability of all cash flows. In contrast to the yield curve, a spot rate curve represents spot rates used to discount individual cash flows of the bond. Hence, a whole range of different spot rates is typically used when equalizing bond's future cash flows to its present value. Solving this equation for the second spot rate will lead to the root \(s_2 = 5.0510\%\). Please note that in this particular example, there is not a big difference between yield curve and spot rate curve, especially for short term maturities. This is due to low-yield nature of government bonds. If the coupon rates were bigger, the difference between spot and YTM rates would be more evident as well.